Usually, I’m pretty much right in line with Blog-a-Bull on the state of our fair NBA team, but I’ve been feeling the exact same sentiment as Greg Couch (who is criticized heavily by Blog-a-Bull with a comparison to Chicago’s most evil columnist) toward the prospect of Rick Carlisle as the new head coach. For those who watch the NBA, Carlisle is someone that is known as a strict disciplinarian – essentially, a less-sarcastic version of Scott Skiles. Now, my track record of making predictions on this blog has been so horrific that I’m pretty sure the sports book at Caesars Palace has a standing rule to set their lines in inverse proportion to what I believe that’s going to happen. That being said, when I looked through some of my old posts recently, I was predicting that the love of Skiles as Bulls coach would end badly over two years ago (before the 2006 playoff series with the Heat and when everyone was drinking the Bulls kool-aid as an upper tier team in the Eastern Conference). He’s great for a young team that’s trying to find its identity (so he’ll probably do well with his new employer in Milwaukee and, if he’d ever consider it, I’ve always thought he’d be a terrific college coach), but that type of coaching can only work for a short period of time in today’s NBA. Carlisle has almost the exact same track record as the Skiles. Think of it this way – John Paxson has modeled the Bulls after the Pistons, yet the players on the Pistons got so sick of Carlisle that they revolted against him (and then won the NBA championship after he left the very next season). 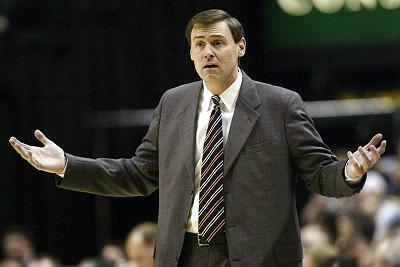 I guess the quandary that the Bulls find themselves in is that they don’t have the talent that would make a Phil Jackson-type “players coach” beneficial, yet they’ve already had a hard-nosed old school coach at the helm for several seasons, so a turnaround artist of that nature probably wouldn’t work, either. At the end of the day, a coach can only do so much without the proper personnel. Somehow, a team that was supposedly a favorite to win the Eastern Conference this season has been exposed as a roster completely composed of undersized shooting guards and power forwards that can’t score. I liked the team last year, yet I’ve known for a long time that they needed a go-to-guy in the clutch (which is why I was immediately begging the Bulls to grab Kobe Bryant when they had the opportunity while, as many people seem to forget, the majority of the yokels calling the Chicago sports radio shows didn’t want a “problem child” to mess up the team’s “chemistry” – for as great of a sports town this city is, I’m continuously amazed at the ineptitude and blind loyalty to “grindy” guys of our fans to the detriment of our franchises). The upcoming draft looms large for the Bulls, but unless the ping-pong balls yield one of the top two picks (meaning the addition of Michael Beasley or Derrick Rose), the team stands gain yet another solid-but-not-impact-type of player. I look back at last summer with a lot of pain, since the Bulls had a chance to grab both Kobe and Pau Gasol. In the infinite wisdom of the organization, it decided that Luol Deng and Ben Gordon were too valuable to give up. Now, the Lakers got Gasol at a garage sale price and rode him and a ridiculously rejuvenated Kobe to the top record in the Western Conference (even without the benefit of Andrew Bynum’s presence for much of the year) – just imagining what the Bulls could have done in the East with that pair is one of the biggest unrealized-yet-realistic dreams that I can ever remember for one of my teams. The upshot is that the Bulls seem to be getting ready to hire a coach in Carlisle that probably will do little to help this club unless there is a massive overhaul in personnel. Amazing what can happen in a year..now we need a replacement for Vinny D..and 90% of the team…Ben Gordon and Deng should be shipped out for high draft picks and start over next year..was that game vs. the Trailblazers an absolute embarassment or what?